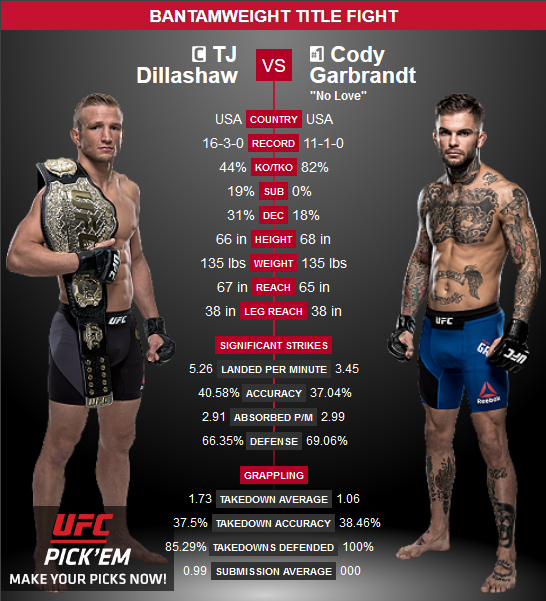 Two of the very best at Ultimate Fighting Championships throw down on August 4 in Los Angeles, California when champion T.J. Dillashaw defends his bantamweight title belt against number one ranked Cody Garbrandt. Dillashaw beat Garbrandt for the championship at UFC 217, which took place this past November. Dillashaw is a throwback fighter in the age of striking. He’s a wrestler and ground and pound artist, delivering forceful blows only when he’s gotten his opponents into the perfect position on the mat. Grabrandt utilizes both striking and wrestling to beat his opponents. 80% of his wins have arrived via KO or TKO. He beat Dominic Cruz at UFC 2017 for the title after striking Cruz 68 times and providing a well-timed takedown. UFC 227 should provide excellent entertainment even before Dillashaw and Garbrandt take to the Octagon. One of the featured fights, virtually a co-main event, has champion Demetrius Johnson battling first ranked contender Henry Cejudo. Since beating Joseph Benevides in 2012, Mighty Mouse has defended his title 11 straight times. He already provided fight fans with a Round 1 KO of Cejudo in 2016 at UFC 197. If Cejudo wants any shot of turning the tables on Demetrius Johnson, he’ll have to switch things up from the opening minute. Before Mighty Mouse and Cejudo throw down for the second time in the past couple of years, #1 Alexander Gustaffson battles #2 Volkam Oezdemir. Both are capable both on the ground and standing up. Gustaffson is from Sweden. Oezdemir is from Switzerland. The championship elimination bout should produce the next contender for the UFC Light Heavyweight belt. Polyana Viana battles JJ Aldrich in one of those classic UFC fights of styles. Aldrich, an American, is a straight striker. She throws down from the first bell. The Brazilian Viana mainly uses Jiu-Jitsu to submit her opponents. T.J. Dillashaw scores first-round knockout of Cody Garbrandt. The rematch between T.J. Dillashaw and Cody Garbrandt lived up to its promise of being every bit of exciting as the first. But this time around, the bout didn’t get out of the first round. Dillashaw, who knocked out Garbrandt in the second round of their first match at Madison Square Garden last November, got the job done in the opening frame of their second encounter Saturday night. Dillashaw got the best of Garbrandt after 4:10 of wild action at Staples Center and retained his UFC bantamweight title via TKO. Henry Cejudo stuns Demetrious Johnson, wins UFC flyweight title. 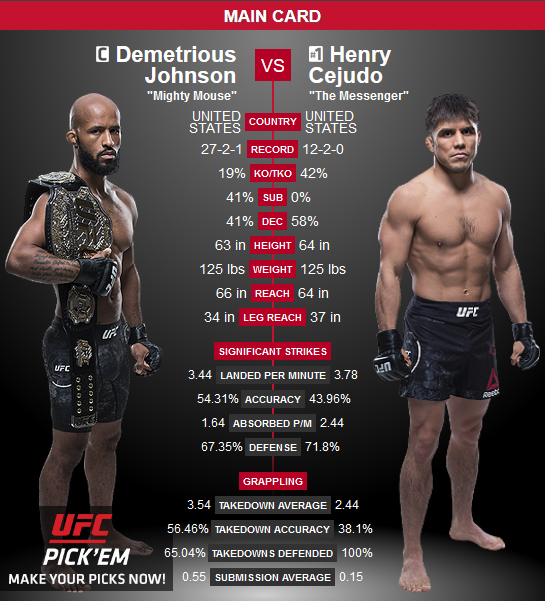 The conventional wisdom going into UFC 227 was that this time around, Henry Cejudo was going to give Demetrious Johnson a better matchup than their first battle. But few could have imagined just how much better the rematch would be. In what might have been the greatest flyweight fight in the history of mixed martial arts, Cejudo defeated the man who many considered the pound-for-pound best fighter in the sport and claimed his UFC flyweight title. After a scintillating 25 minutes of action at Staples Center, Cejudo won the championship via split decision, getting the better end of two out of three 48-47 scores on Saturday night. With the victory, Cejudo ended the second longest UFC title reign in history at five years, 10 months, and ended Johnson’s win streak at 13 and unbeaten streak at 14. He also avenged a first-round loss to Johnson two years ago. 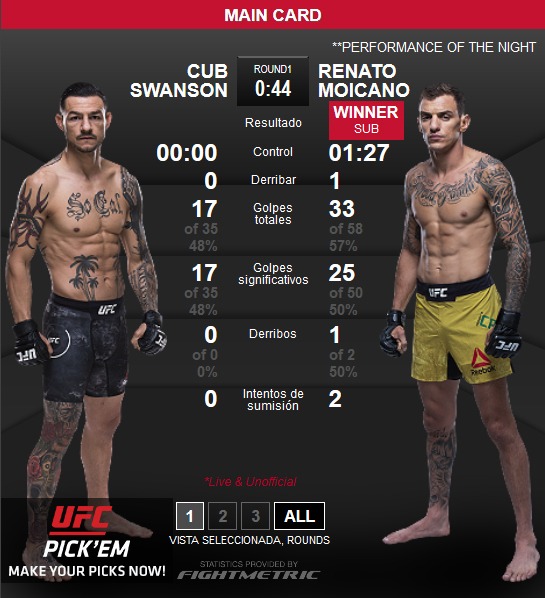 Renato Moicano submits Cub Swanson in first round. Renato Moicano has been quietly developing into one of the finer fighters in the UFC’s featherweight division. But after scoring the biggest win of his career on Saturday night, he’s not likely to be under the radar much longer. The American Top Team competitor from Brazil wasted little time getting to work against popular veteran Cub Swanson before earning the victory on Saturday night. A rear-naked choke got the job done at the 4:15 mark of the opening round of their UFC 227 main-card bout at Staples Center. After a brief feeling-out period, Moicano turned the bout in his favor by dropping him with a perfectly placed left jab. Moicano rained down hammerfists, but Swanson, to the delight of his hometown fans got back to his feet. J.J. Aldrich gets unanimous nod over Polyana Viana. It appears working with the greatest strawweight fighters in UFC history is rubbing off on the Colorado resident. 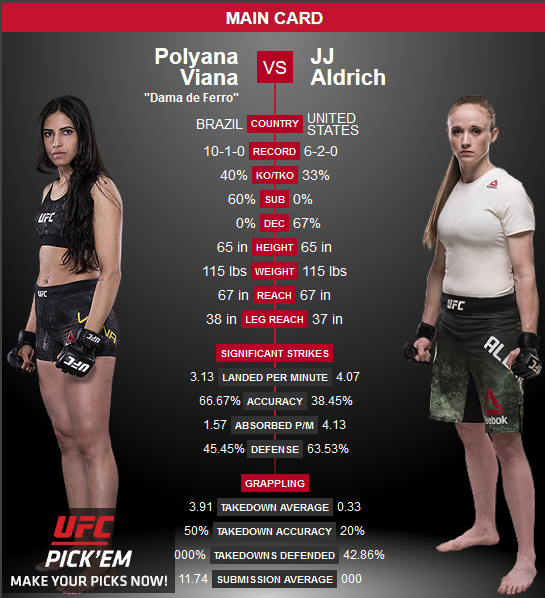 Aldrich employed a smart game plan against Polyana Viana on Saturday night at UFC 227 and was rewarded with it with her third consecutive victory. The judges’ scores at Staples Center were a pair of 29-28s and a 29-27 for a unanimous decision. The opening round was something of a stalemate, with plenty of grinding clinch work. Viana scored a trip and turned it into a guillotine, but Aldrich escaped and the duo resumed their clinch game. Things opened up somewhat in the second, as both competitors had their moments in the standup. Viana used front kicks to follow up with combos, and Aldrich, while wary of Viana’s kicks, managed close the distance and landed unquestionably the harder shots, connecting with straight hands and hooks. The fight hit the ground later in the round with Viana starting out with dominant position but Aldrich righting things before the horn. 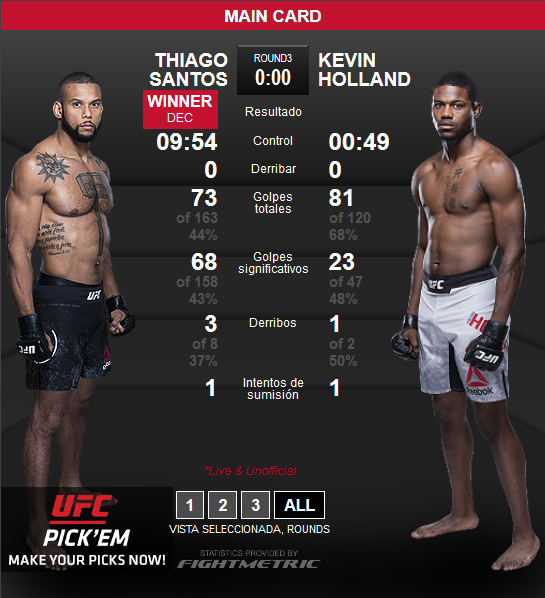 Thiago Santos earns decision over Kevin Holland. Kevin Holland has a solid potential as a fighter and a quirky personality which could make him a star. But he also was making the jump from Dana White’s Tuesday Night Contenders series to a pay-per-view main card in just over six weeks, and it proved a bit too big of a challenge. While Holland had his moments, hard-hitting Thiago Santos mostly had his way in an entertaining middleweight bout on Saturday night at UFC 227. The judges scores were 29-27, 29-27, and 29-26 for a unanimous decision. The action started eary, as Holland used the momentum from a sprawl to pull Santos to the mat and attempt an omoplata. When he couldn’t get that, he went for a Kimura. Santos escaped, though, and transitioned into top position, where he began to punish Holland with heavy hands. Santos stood, Holland landed a couple upkicks, and Santos went back to the mat and hit Holland with elbows. It went this way for awhile in the second, too, before Holland escaped and had his best sequence of the fight, dropping Santos and landing elbows from side control as the round ended.